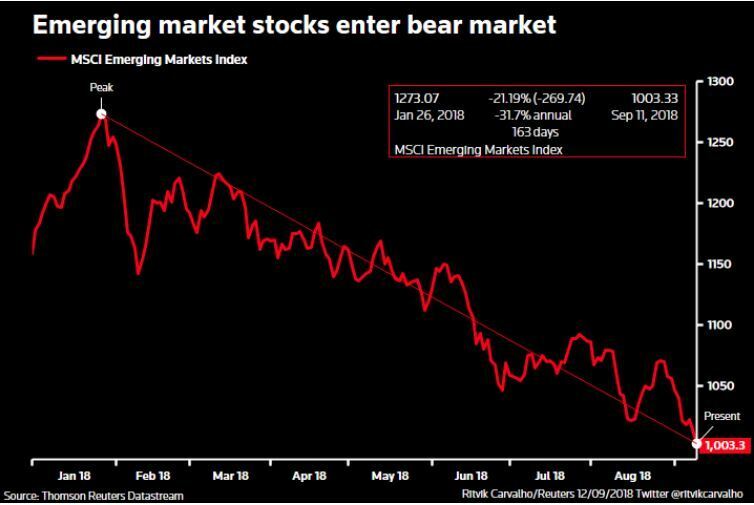 Having tumbled some 22 per cent from their January peaks, emerging equity markets are in territory commonly regarded as a bear market. Emerging market investors are trying to gauge whether a currency crisis and the steep interest rate hikes being used to fight it could turn into a broader slowdown and even recession. On Thursday, Turkey’s central bank attempted to draw a line under a lira collapse of almost 40 per cent this year by hiking interest rates more than 6 per centage points to 24 per cent. Argentina is struggling to shore up its peso, which has more than halved in value despite punitive interest rate rises to 60 per cent. 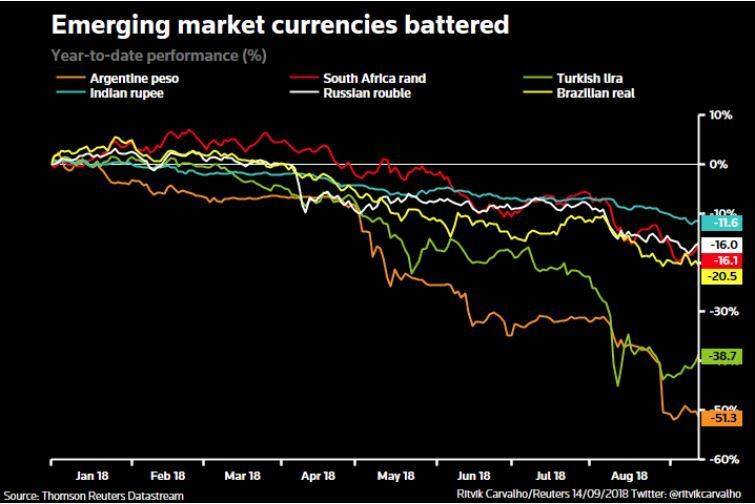 Other currencies have been caught in the slipstream, with India’s rupee plumbing record lows and South Africa’s rand, Russia’s rouble and Brazil’s real losing 15-20 per cent this year so far. Signs are appearing that months of market turmoil are starting to take the toll on real economies. 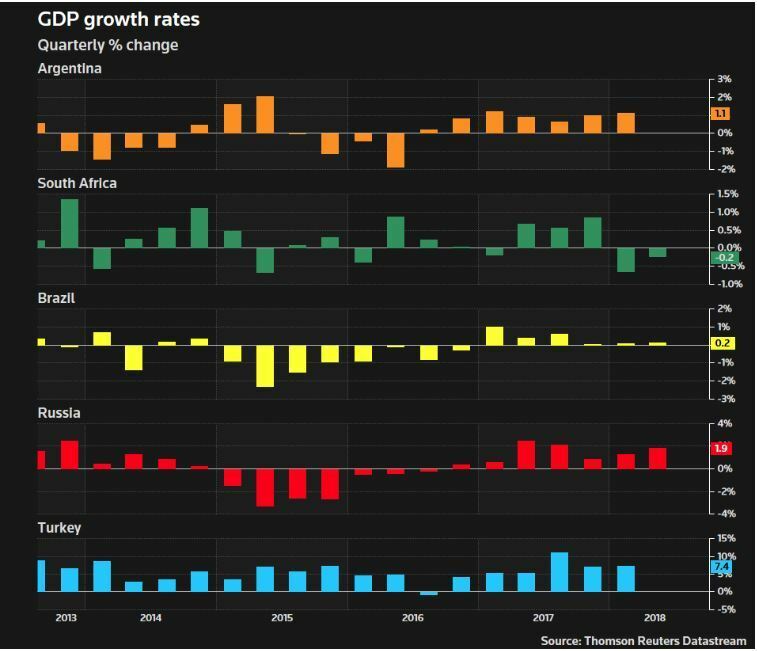 South Africa unexpectedly entered recession in the second quarter of this year, Argentina is predicted to follow suit and Turkey is now widely forecast to experience a hard landing over the next year. 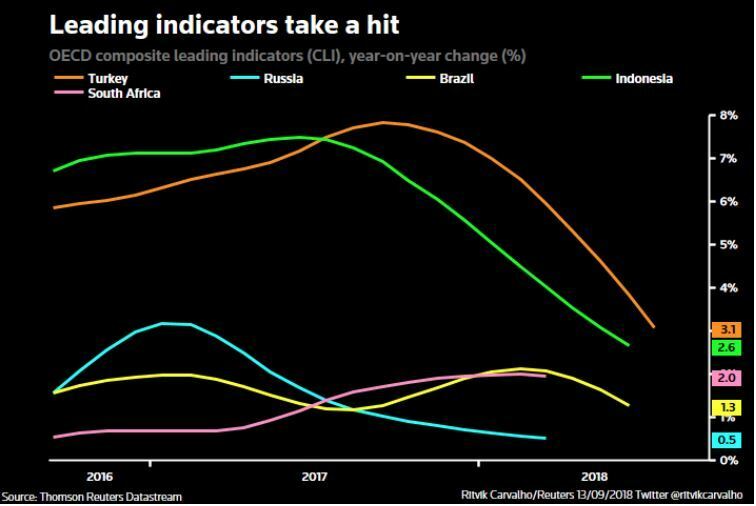 So what is growth like in these countries right now, what signs are there of a shock to business and consumer confidence and has the near sudden stop in investment flows seen 2019 economic forecasts deteriorate markedly? 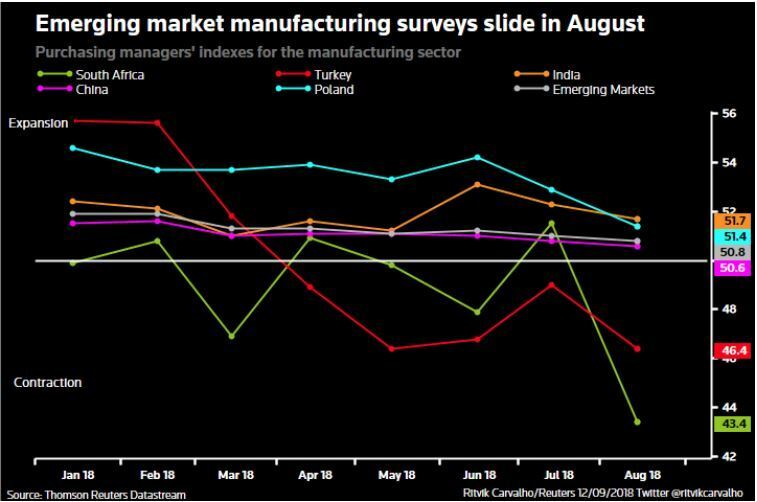 Purchasing manager indexes have suffered sharp drops across many developing nations, according to data earlier in the month. “When you have an environment where (the) US dollar is strengthening and US front-end rates are going up that tightens external financial conditions for emerging markets, especially for the deficit economies,” said Murat Ulgen, global head of emerging marketsresearch at HSBC. Meanwhile faced with capital outflows, many emerging market policy makers have opted to hike rates, thereby also tightening domestic financial conditions, Ulgen added. “Given that markets have been volatile, generally speaking, and rates have been higher and equity markets have been lower in summer months … it is highly likely that financial conditions are still staying in the negative territory,” he said. Having tumbled some 22 per cent from their January peaks, emerging equity markets are in territory commonly regarded as a bear market, is often considered to be self-sustaining decline. “Tighter financial conditions are going to weigh on economic activity going forward,” predicted Ulgen. Emerging markets are familiar with such crises. The Institute of International Finance found nine episodes since 1980 where when real exchange rates fell 30 per cent or more, the devaluation was sustained for at least three years and the decline did not reverse a previous overvaluation. Mexico suffered such a fate in 1995, Indonesia and Russia in 1998 and Brazil a year later. Meanwhile Argentina and Uruguay recorded such declines in 2002, Egypt in 2003 and 2016 and Ukraine in 2014. “There are only 9 episodes historically where the real exchange rate has fallen as much and as permanently,” Robin Brooks, chief economist at the IIF wrote in a recent paper. A weaker currency helps close balance of payments gaps by boosting export competitiveness but also by pinching domestic purchasing power while tighter credit saps demand and growth. What’s more, analysts are also closely assessing the impact of a growing number of trade conflicts and tariffs on emerging economies, which have seen trade become an increasingly important factors in generating economic activity. 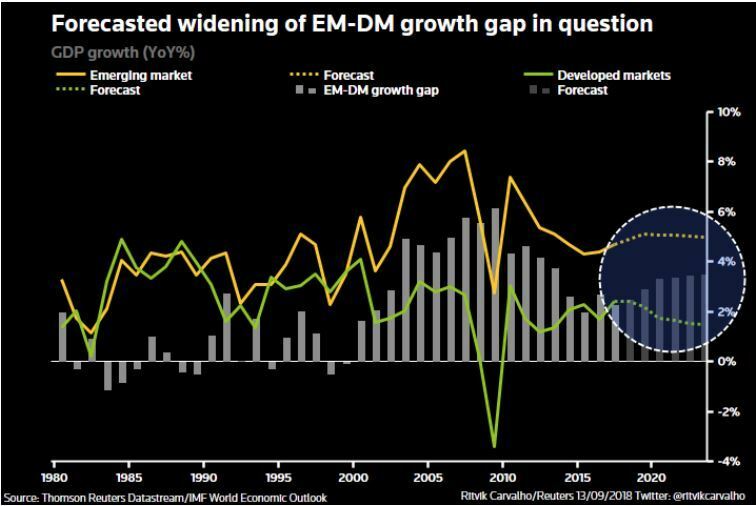 Ulgen, who has already chopped his economic outlook for Turkey, Argentina, Brazil and South Africa, predicts the growth differential of emerging versus developed market growth will shrink in the near-term. Meanwhile capital flows will play a key role in how the most vulnerable economies will weather the latest crisis. Last year saw healthy flows into emerging markets, according to HSBC, which estimates that in 2017 bond markets saw inflows of $70 billion dollars while equity flows were $65 billion. Following a healthy start to 2018, emerging bond markets have suffered a full reversal of flows; equity markets have seen just under half of the $55 billion that had come in until the end of May leave again, HSBC found. Luis Organes at JPMorgan warned that a “sudden stop” or abrupt reduction in capital flows into emerging markets and associated negative feedback loops should bring an extended period of adjustment for countries running a large current account deficit. “Despite recent EM growth downgrades, activity data continue to point to downside risks to our GDP forecasts,” he wrote in a recent note to clients.